Street Furnishings have just supplied a new design bollard for TfL contractors to trial outside subway entrances. This high visibility bolard is to remind and warn both pedestrians and cyclists that the area is shared. Appledore Quay. New Post & Rail system has been just installed around the Quay. With specific requirements for a system that will last the rigours of the sea elements along with strong winds that whip up along the coastline. Street Furnishings have supplied a cast polyurethane system of uprights and rails moulded on steel cores. Heathrow Airport have just had installed our Modified Solar belisha Beacon slimline. The slimline version is installed in situations where there is the possibility of wide high sided vehicles that could possible be clipped by the vehicle. Tactile studs used at Zebra Crossings in Okinawa Japan. 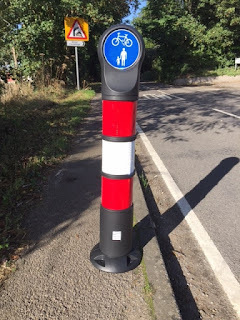 Thought this was quite a good idea, helping the visually impaired to stay on track when crossing the road to ensure they exit the road at the correct point where there is a lowered kerb and avoid any potential trip hazard. Believe it or not but this post box is located in the capital city of Okinawa Naha Japan and is in current use. Probably the best looking Carlesberg Telescopic Bollard in the World! 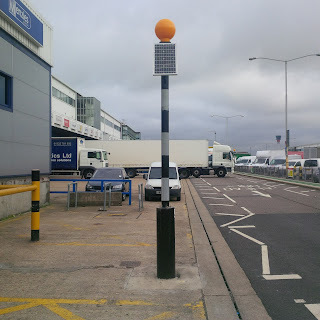 If Carlsberg made a telescopic bollard it would probably be this one! I think this is the most attractive telescopic bollard on the market. This is a cast polyurethane bollard on a telescopic locking mechanism. This has got to be the best looking lockable telescopic bollard available. Reflective band installed in the recess. Bollard dropped back into below ground housing with hinge flap dropped back into place so there is no trip hazard. Contact our sales team on 01189 404717 for more details. 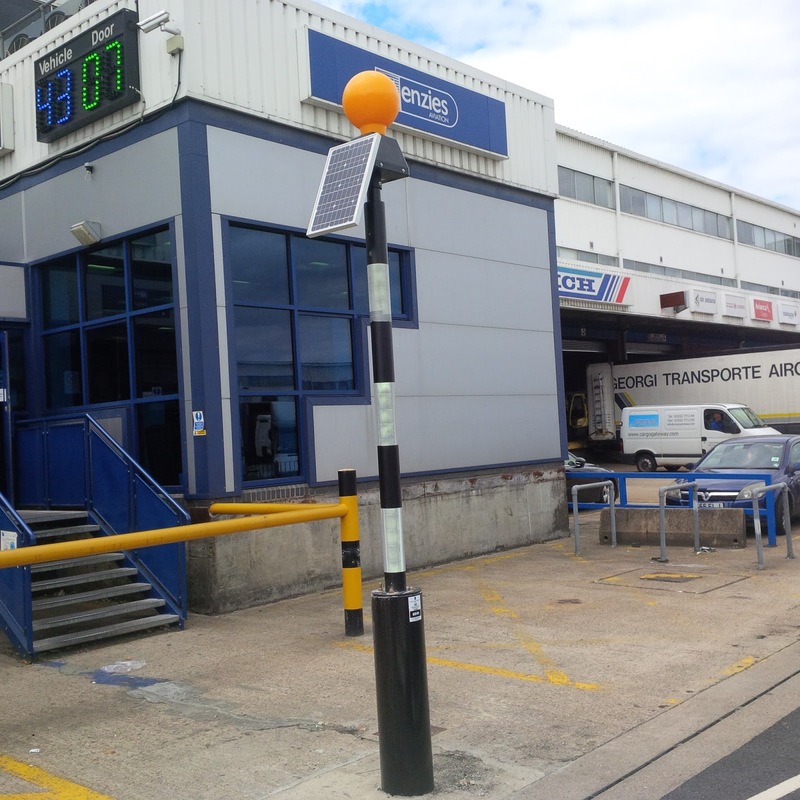 The all new Solar powered Centre Island Beacon c/w 25w solar panel is 76mm post top mounting. The unit incorporates a photocell so the unit operates only during the hours where power needs to be consumed from dusk to dawn. 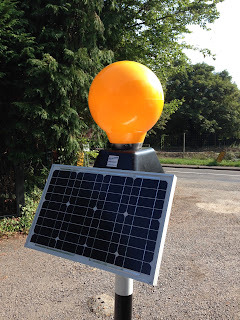 In areas where the southerly aspect may be limited for harvesting the suns energy, a second solar panel can be added and positioned on the post to gain as much solar energy as possible. This is vital for areas further north in the country especially during the winter months. Fit it and forget! We can supply all the items you require to make your centre island crossing point totally solar powered including illuminated signs and illuminated keep left bollards. This is a great saving on installation costs. 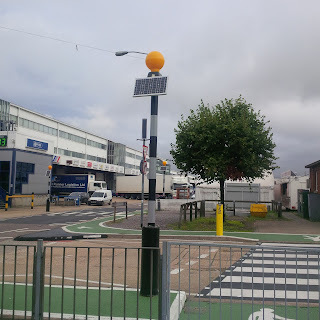 This product is also available as a flashing Belisha Beacon version.